Is it right to share a recipe with you when it is for something I can not keep in my house? I think so!! I have been making these pretzel's for years now. The girls that I used to work with, at the bank, would know these as "Lori's Pretzels". Anything Lori brought in for our food days, never lasted long! 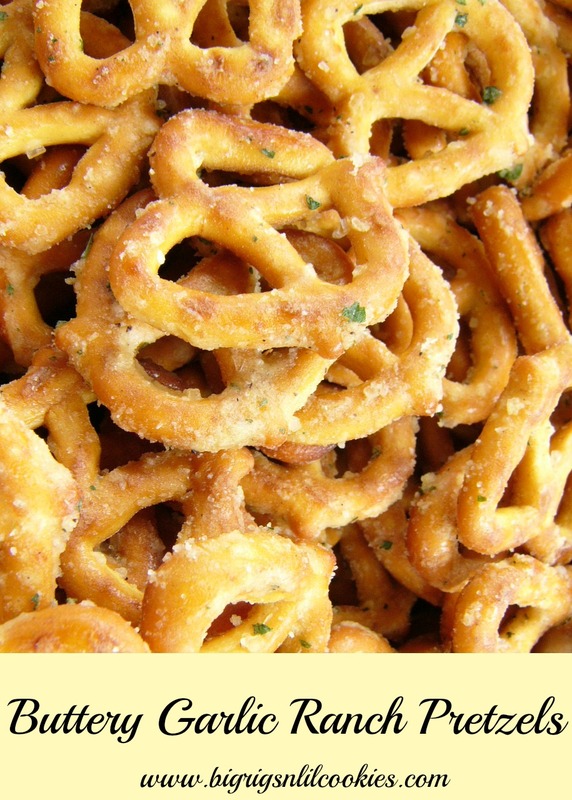 These pretzels are just so simple, and so good! Honestly, I can't keep them in my house! I have made several batches recently for some parties, and I just want them out! Why? If they are in the house, they disappear. Gone. No where to be found. Why? You eat them. Addictively. One handful after another. Salty, buttery, garlicky, ranchy.....Need I say more? Try 'em. Let me know. Can you eat just one??? Pour pretzels into large mixing bowl. Toss with popcorn oil, until pretzels are coated with the oil. Sprinkle the dip mix and garlic powder over the pretzels. Toss again until all the ingredients are distributed over all the pretzels. Spend a couple minutes doing this to be sure everything is evenly distributed. Pour onto large cookie sheet and let dry for several hours. Once dry, store in airtight container. Oh my, I must try these! I have heard of something similar but using saltine crackers instead of the pretzels. Yum! These look so delicious. I bet they are like crack haha! Perfect for parties or just for snacking! Yay!! A co-worker was giving me a similar recipe, but she used 8, yes EIGHT boxes of crackers, like mini clubs. I about fainted. But this scaled down version is right up my snacking alley!! 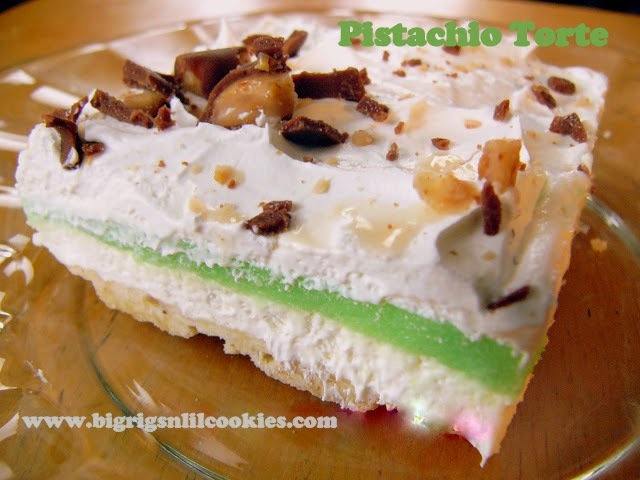 I smile when I see these and will definitely be making these soon. Thank you for sharing on Thursday's Treasures, I'm featuring them on Week 99! Have a lovely week! This recipe is the perfect snack, they look so delicious. Thank you for sharing on Foodie Friends Friday. I'm sharing this on my FB page this afternoon. If you all really knew what crack does to families and communites it wouldn't be funny haha. Just made these to take for snacks tomorrow for Thanksgiving at Mom's! Can't wait to try them! Want to make these now but I don't have popcorn oil. Can I just use butter? Corn oil works, just doesn't taste as buttery. My grandma made something similar to this, just with oyster crackers and added dill and lemon pepper. How much corn oil should I use? I've never used anything but the popcorn oil, so I can't say for sure. My thought would be that butter would make the pretzel soggy. So, if you had to have an alternative, I would substitute with a regular cooking oil. Wouldn't you have to put them in the oven otherwise it would be on the greasy/sticky side? I've never had them get sticky or greasy. There isn't enough oil to get them messy. Of course, if you needed to speed up the process and didn't want to let them set for a couple hours, a short time in the oven would be fine. So easy and looks great! I made them a bit healthier using liquid unflavored coconut oil and left out the garlic. They are awsome! i want to make these for a party and was wondering how far in advance can I make and store these? I want to make these for a party and was wondering how far in advance I can make them and store them? 2 to 3 days ahead would be fine, as long as you store them in an airtight container. For best results, I wouldn't make sooner than that. Only one ounce of the ranch dip??? That is all I use. You can certainly use more if you like. Have you ever tried them with Italian seasoning instead of ranch? No, I haven't tried that. Could be a tasty alternative. I used margarine and canola oil since I didn't have popcorn oil. The only thing I suggest is baking these at 350 for about 10 minutes. The extra crunch it brings really makes these pop. Love them. Gave these as Christmas gifts this year. They are addictive! Thank you so much for this recipe. Thanks for the most addictive recipe ever. These are so good. My husband and I go through a bag of pretzels a week now. I could eat a lot of these! Yum! I don't want to buy a box of popcorn for one packet of oil. I saw in a previous comment that you suggested corn oil. How much of the oil should I use? I've never used anything but the popcorn oil, so I can't say for sure. I would start with the same 4 ounces called for, but again I have never used anything but the popcorn oil so I can not be sure of the results. I have tried Ranch Dip and Ranch Dressing the Ranch Dip is way more salty I prefer the dressing mix.